Karel Dujardin was a Dutch Golden Age Painter and engraver. He was born in Amsterdam in 1622. Dutch by birth, but most would agree that Dujardin's heart was in Italy. He spent the majority of his life there and he is most well-remembered for his Italianate landscapes and satirical engravings. Historians believe his early teachers included Nicolaes Berchem (1620-1683) and Paulus Potter (1625-1654). 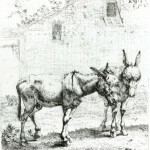 Before traveling to Italy, Dujardin gained some success as an engraver. His pieces often depicted animals that showed their true nature. He would show some sleeping and others wallowing in the mud. 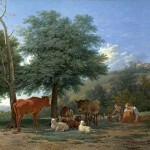 Work animals were often shown, not at work, but grazing peacefully. His engravings are clear with bold and distinct lines. He also made a number of satirical engravings. As one historian put it, he was best known for his pictures of quacks. They would travel from village to village, present a bit of entertainment for the locals and then offer elixirs that did little more than empty the pockets of the villagers. During this first trip to Italy, Dujardin began to experience his first success as a painter. He came to love Italy and virtually abandoned painting and engraving animals in favor of reproducing beautiful Italian landscapes. Dujardin, by all accounts, was happy and gregarious. He enjoyed life and would paint to pay for his entertainments. Unfortunately, his debts outgrew his success. He took to painting portraits. They were well-done but could not cover his growing debts. He set out to return to Holland but was diverted by friends in Lyons. He sold a number of his paintings, often of the dawn and early morning dew but he continued to spend far more than he took in. His landlord in Lyons was a wealthy old woman. She extended the artist a great deal of credit and finally decided to collect what she was owed by her young boarder by making him marry her. What happened next is unclear. While researching this article for The Famous Artists, I came across two very different versions of the outcome of that marriage. The first has the artist returning to Amsterdam to present his wife to his family and apparently suffering great difficulties resulting from his marriage. His work suffered and he returned to Italy where his spirits and his artistic abilities returned. When his paintings once again began to be fashionable in Amsterdam, his family invited him home to paint his wife's portrait. The artist told his family that his wife needed to be in Italy and that was where they would stay. No further explanation was given as to how they eventually parted and whether or not her death preceded their separation. The second tale has the young artist growing weary of being married to an old women. They had been living in Amsterdam when he visited an old friend who was leaving for Italy the next morning. Dujardin told his wife that he was going out to purchase some linen and promptly left for Italy with his friend abandoning his wife in Amsterdam. Whichever tale is factually accurate is probably lost to time but both make it clear that his marriage was one of convenience. None of the historical accounts of his marriage mentioned the woman's name and all make it very clear that the only reason Dujardin married her was because she was old and rich. Both versions have the artist traveling to Italy, returning to Amsterdam and later returning to the Italy that so inspired him. Like many artists of the time, Dujardin was commissioned to paint altarpieces and other religious works. Dujardin was a protestant working in a predominantly Catholic country. He was quite disappointed when he learned that when painting for the church, artists were not fully compensated in cash. Like many non-Catholic artists, he learned of this unique compensation strategy after completing the work. Traditionally, Catholic churches paid 50% of the agreed upon fee in cash and paid the remaining 50% in the form of prayers and blessings. One anecdote has Dujardin complaining that as a protestant he should receive his payment solely in cash. The church representative is said to have replied that the protestant Dujardin needed the prayers even more than Catholic artists. 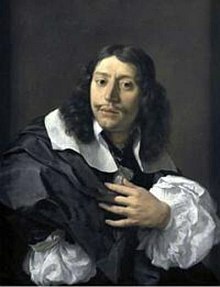 Near the end of his life, Dujardin traveled to Venice and was offered housing by a Dutch art dealer who hoped to profit from Dujardin's talent. The artist died in 1678 before the dealer could realize any financial gains from his generosity. Again, the mythology of the artist's life takes a bit of a divided path. Most agree that he died unexpectedly and his death had something to do with something he ate. One historian claims he overate before sufficiently recovering from an illness. Another vaguely claims he essentially gorged himself to death. Ironically, the artist who was so unhappy with his treatment by the Catholic church was buried by friends according to the rites of the Roman Church. He is best remembered for combining the aspects of landscape painting from his home and adopted countries achieving skies which combined the tranquility of Holland with the light of Italian summer.